How do I follow up last weekend? There's really nothing that can top that. I have to apologize to all my friends on social media if I keep talking about last week's meet - I'm still on a high from it, and it was such a fabulous moment in my life, that I'm going to hang onto it as long as I can. But what next? 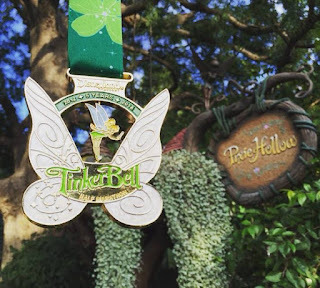 Well, my next big event on my radar is the 2016 Tinkerbell half marathon... but I'm not JUST doing the half marathon, I'm doing the Pixie Dust Challenge, which also means that I'm doing the 10k the day before the half marathon. 19.3 miles in two days. I've done it before, but I was in better shape then. I wasn't just nervous going into this meet - I was stressed. As I'm sure you could tell from my previous posts, especially my most recent one (where I mentioned that I was crying in my car), it's been a really long, grueling journey getting through the months of training leading up to this meet: it was the hardest I've ever trained in the history of my training, which meant that I was constantly feeling the effects of it - soreness and aching to keep me up at night, back spasms, hobbling everywhere I went. 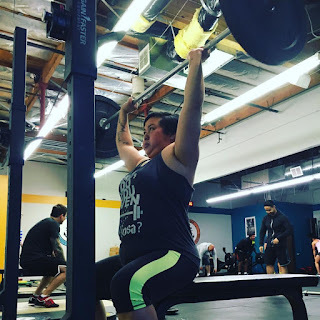 And my bench press is my weakest lift, so I was legitimately worried that I would bomb out and disqualify myself and not get to move on to the deadlift, and I feel like I've been struggling with this lift every step of the way (probably because I hate doing upper body work). "Who knows where thoughts come from? They just appear." 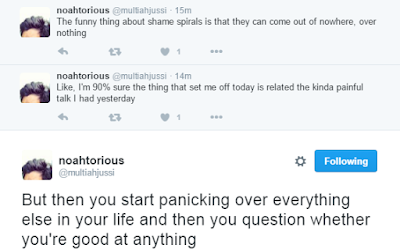 I had a really rough day yesterday, emotionally, and then I happened to see these tweets today, and the last one especially so perfectly encapsulated what I went through. It starts with small thoughts that are nothing out of the ordinary, but then it just piles on, and the weight that each one adds to my mental state grows exponentially - I'm stressed out lately because of my knee injury not healing fast enough and my competition coming up. I'm also feeling a general sense of "battle fatigue" because you know how I feel about racism and sexism, and I feel like, with social media and this being an election year and everything, there are just a lot of disgusting headlines. These have been battering at me in recent weeks. It's thrown around a lot. 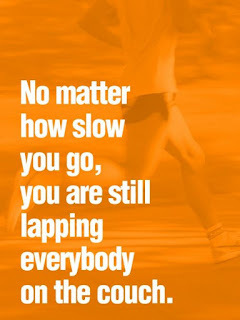 I fairly confident that whoever originally said it, as well as whoever has shared it since, was operating from good intentions and was trying to be encouraging to us slowpoke runners. I'm sure even I've said something like it a time or two. But what I've come to realize is that... we're throwing the couch potatoes under the bus, and that doesn't sit right with me. I get it - we want to reward effort. Especially effort from beautiful, athletic people. And if you're not beautiful and athletic, you will at least get rewarded for trying to be beautiful and athletic. Or something like that. Society only seems to be okay with fat people if they're trying not to be fat anymore.